Many of you - maybe your colleagues - may be wondering what all the fuss over the Internet is about, Web 2.0, Social Networking, etc. Why are we training faculty to teach online? Could it be the 1.73 billion Internet users worldwide? Why are young, energetic faculty like Dara Evans experimenting with Twitter and Facebook in their classes? Could it be the 50 million tweets per day? Or the 400 million people using Facebook? How about Facebook's 6 million page views per minute? Why the interest in podcasting and video? Hmmm ... 1 billion videos per day watched on YouTube - could that have something to do with it? Think of these new tools not as replacements or substitutes for what you're already doing. 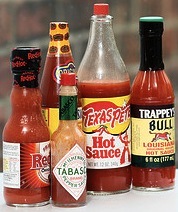 Instead, think of these tools as the hot sauce or special sauce that spices up your lecture or your discussion. Also worth a read is a recent report by the Pew Internet and American Life Project - The Future of the Internet. Individual stats like Facebook passing the 400 million user mark, Twitter hitting 50 million tweets per day, and YouTube viewers watching 1 billion videos per day are impressive on their own, but what if we looked at Internet-related stats collectively? Jesse Thomas did just that in his video State of the Internet. The video — created and animated by Thomas with data from multiple sources — highlights some remarkable figures and visually depicts the Internet as we know it today. It’s a must-watch video for anyone trying to wrap their minds around just how immersed web technologies have become in our everyday lives. There are 1.73 billion Internet users worldwide as of September 2009. There are 1.4 billion e-mail users worldwide, and on average we collectively send 247 billion e-mails per day. Unfortunately 200 billion of those are spam e-mails. As of December 2009, there are 234 million websites. Facebook gets 260 billion pageviews per month, which equals 6 million page views per minute and 37.4 trillion pageviews in a year.